Neat & Cheap Digital TV for travellers – Do your dream! In the past I have tried some devices that enable you to watch TV on a laptop and I had mixed results. Flakey quality, high power consumption, and unreliable software. So I gave up and bought a Meos 13.3″ TV unit which has served us well for a few years. However, this unit failed, and with zero after sales service and no spares avaialable, its destined for the bin. I avoided the unbranded eBay units, and bought a branded August Digital Freeview unit from Amazon mainly due to the price (£16.49 delivered) and the fact most of the reviews were excellent. But also, its a brand, with an English support website – www.augustint.com – that in istself is a rareity. So, the box arrived and I was surprised to find it was a full cosumer box, with all the cables, remote control, CD, and even an indoor aerial. I would not recommend the aerial as you do need a decenr aerial same as any TV. Rather than use the CD I downloaded the latest drivers and software from their website and installed those (though the version numbers were same as CD). The installation of the drivers and the software was trivial and worked perfectly on Windows 7. The device simply plugs into a USB port and takes all the power it needs from there – no other power required. Its about the size of a USB memory stick – so quite tiny! The remote control is the size of a credit-card. All good, so I ran their software, Total Media 3, which tries to be an full “Media Center” and integrates all your music and videos & DVD as well as the TV. Actualy rather impressive and it does just work. It feels like the real Windows Media Centre but a little quicker (and simpler) – but no complaints. Setting up the TV card is simple, though two niggles – the channel scan takes longer than a TV, and the channels aren’t in natural order. But, apart from that it simply just works! The TV will work full-screen or in a small window, and the sound/picture quality is as good as you’d hope. 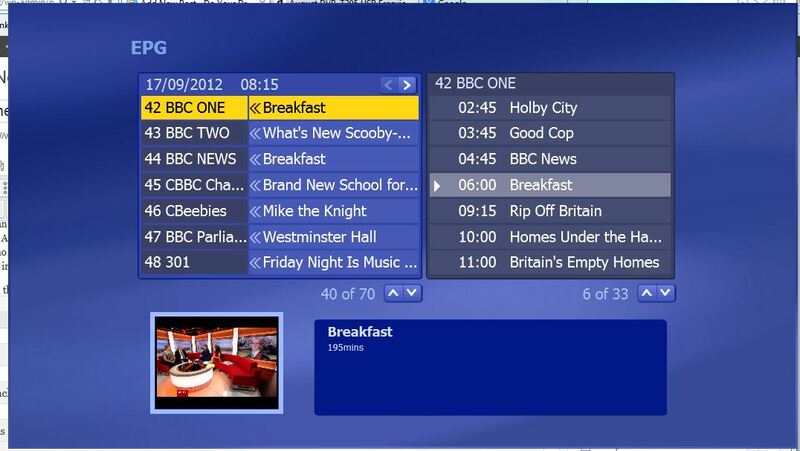 You EPG (TV Guide) can either be via the Internet or via the aerial – so no Internet required. Great idea! For £16.49 – an absolute bargain and not worth fixing the old TV for! If you go for alternative makes, make sure the device has an English website where you can get updated software, and it isn’t a cheap clone where support will be non existent. Well just started to plan some wild camping this year and i found you guys my 1st mission was a tv for the van and here we are. Can i just ask what aerial you went for in the end, Did you use the one supplied or get another and i am guessing in needs to plug into usb ?? I have an omnidirectional aerial, “status” I think on the roof…. So use that.